Journey in style aboard this luxury catamaran as you sail to the best snorkel spots in Aruba. Discover one of the Caribbean's largest wrecks and get close to the abundant marine life. Take a refreshing swim in the crystal clear water before enjoying a sumptuous deli-style lunch with full open bar. Your first stop is Catalina Bay, a nice shallow area ideal for those who have not snorkeled in a long time. You will have the opportunity to get used to your snorkel equipment while viewing lots of colorful fish and corals in their growing stages. Then onto the Antilla Ship Wreck, one of Aruba's most famous snorkeling spots. The wreck is 400 ft. (122 meters) long and sits in 60 ft. (18 meters) of water. When the Germans invaded Holland during World War ll, this German freighter was scuttled by its Captain on purpose to avoid confiscation by the Dutch in Aruba. The wreck is now surrounded with colorful fish and corals. The catamaran features two marine bathrooms, two sunning nets, plenty of seating space, stereo music and a fully stocked bar. A special swimming ladder makes it easy for passengers to step into the water. There's a great waterslide too. Take advantage of a snorkel lesson, complete with all equipment. A full open bar is included after snorkeling, where the friendly crew is always on hand to make the sail a wonderful experience. They keep a watchful eye out for empty cocktail glasses and entertain you with local music, dancing and storytelling. Head out to the most famous snorkel spot in Aruba, the Antilla Ship Wreck, aboard a luxury catamaran. Dip your mask underwater, kick your fins, and discover the 400-foot (122 meters) long wreck, which is now home to a variety of tropical fish and colorful coral. Along the way, you'll also stop at Catalina Bay, ideal for beginner snorkelers. At Catalina Bay, a nice shallow area ideal for those who have not snorkeled in a long time, you will explore the shallow waters and enjoy a variety of colorful tropical fish and several species of corals. The catamaran has a top speed of 35 miles per hour in Aruba's famous winds, but still offers an very stable ride. It also features two marine bathrooms, two sunning nets, plenty of seating space, stereo music and a fully stocked bar. A special swimming ladder makes it easy for passengers to step into the water for snorkeling. A friendly crew is always on hand to make the sail a wonderful experience. This 3 hour excursion also includes an open bar, snorkeling equipment and instructions. Take in all the pleasures of the sea by enjoying a half-day sail and snorkel experience on Aruba's newest catamaran. Lulled by the rhythm of the sea, lie on the spacious sun deck or enjoy a cocktail under the shaded cabin top. When you are ready to experience the beauty of the sea below the waterline let our friendly crew assist you as you prepare for your snorkeling adventure. Snorkeling stops include the coral-laden Antilla Shipwreck, fish-friendly Boca Catalina and the unique Arashi reef. During your snorkel experience indulge in a delicious lunch prepared by top island chefs or sample a cool tropical drink or beer from the open bar. If you like to snorkel, but not ready for scuba, then try Snuba (SNorkel+scUBA)! Aruba's most popular underwater activity. Explore the beauty of Aruba's underwater world in the most convenient way. 'Go Beyond Snorkeling' and breath easily underwater without wearing heavy restrictive scuba diving gear. No snorkeling or scuba certification needed. A private guided tours permits underwater explorers as young as 8 years old to safely descend to a depth of 20 feet with the aid of a SNUBA instructor exclusively available with De Palm Water sports (45 minutes, including instruction). Experience Aruba's magical marine life. 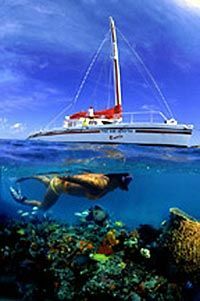 You will have the opportunity to snorkel two spectacular locations including the largest and most famous shipwreck in the Caribbean. The Antilla, a 397-foot-long German freighter sunk during WWII and now home to a myriad of colorful fish and corals. You can explore this historic wreck, portions of which are only partly submerged. W.W.II German freighter. Best wreck in the Caribbean. Wreck is over 400 feet long and sits on its port side. It breaks the surface from a maximum depth of 60 feet. Abundance of colorful fish on coral encrusted wreck. Large jewfish live in the forward section. Throngs of blue tangs will eat bread out of your hands at the stern of the boat. There are more fish here than on any reef. It is definitely a dive to be logged. In 1992 a 120 foot fuel barge was sunken to create an artificial reef as well as a new dive site. The wreck is surrounded by a reef where you can find widely spread leaf and brain corals. Rays and lobsters are occasionally spotted at this site. An exciting dive. The Jane C wreck is a cargo ship standing upright in sand. Bow is in 65 feet of water and stern is in 94 feet. Wreck is 250 feet long. Chain is hooked throughout the coral reef. Huge cargo spaces. Often visited by barracudas, manta rays and even turtles. Strong currents sometimes. Definitely an advanced dive. The Pedernales wreck is an oil tanker that was torpedoed by a German submarine during the last World War. The wreck is a paradise for dive beginners. The wreck's several large pieces are spread out between coral formations, and wreck cabins, wash basins, lavatories, and more is completely visible - even the wreck's pipeline system. The wreck of the Pedernales was cut into three pieces by the U.S. military during the war. The center piece, damaged by the torpedo, was left behind, and the two end pieces were towed to the U.S. and welded together into a smaller vessel. The new ship was a part of the Normandy invasion fleet. The area around the Pedernales wreck is known for its many types of groupers and its bounty of angel fish. The Star Garret is a cargo ship wreck, which is 300 feet long in approx. 63 feet of water. Great abundance of sea life, big spider crabs, barracudas, and large cargo spaces. Exciting dive. Two airplanes, an S-11 and a DC-3, have been sunk intentionally as an artificial reef. After hurricane Lenny in 1999 the DC-3 was dragged to 80 feet of water. Before completely intact and now in two big pieces where penetration of the wreck is still possible. Other parts of this plane are located at a depth of 45 feet on a reef. The S-11 was sunk in 2004 and except for the nose the plane is completely intact. Penetration of this plane is easy. This is a very nice and interesting dive with a great photo opportunity. Nice reef that starts in 15 feet of water and goes to 80 feet. Lots of brain coral, orange cup sponges, parrot fish, damsel fish, and butterfly fish. Easy and beautiful dive with a lot of orange sponges, staghorn coral and damsel fish. Starts in 15 feet of water and goes to 60 feet. Site where the barge portion of the old Bali Restaurant was sunk. Nice sloping wall/reef with lots of fish, plume worms, moray eels and eagle rays. Starts in 25 feet and goes to 130 feet. Definitely an advanced dive. Great reef with lots of fish, lobster and moray eels. Starts in 15 feet of water and goes to 80 feet. Seahorses to be found at this site in about 45 feet of depth. Great dive for photography and winning a free dive when finding a seahorse. Drop off from 5-130 feet. Beautiful reef with lots of parrot fish, barracudas, lobsters and lots more. Starting shallow at 20 feet of water, this reef slopes beyond 100 feet with large, healthy brain, fire and star corals, boring and encrusting sponges and gorgonians. Lobsters are common while fish life includes barracudas, rainbow runners, parrotfish, surgeonfish, yellowtail grunts and sergeant majors, moray eels and many species of reef fish. There is often enough current to turn the dive into a drift dive. It is also a good dive for normal and macro photography. Huge corals guide you into the homes of big barracuda's and rainbow runners patrolling coastline. Brain, mountain, star, and tower corals as well as deep water gorgonians and soft corals abound here. An excellent dive for macro photography. One of the best dive sites in Aruba. Starts in about 5 feet packed with corals and slopes down to 130 feet. At 130 feet you can enjoy 5 islands of coral with an abundance of mas bango fish which draw large fish like big jacks, tuna, and barracudas. The reef here is extraordinary, beautiful, and preserved. Home of seahorses and turtles. This is most definitely a must do dive, photo, and a great dive to log. Easy for beginners and great for advanced divers.